Not your average box of chocolates. From the chocolate wizards at Chocolat Moderne, this is a far cry from your ordinary box of chocolates. 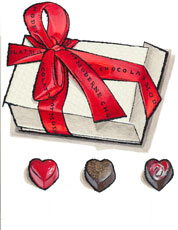 A dozen heart shaped truffles come nestled in a white box tied with a silky red ribbon: white chocolate hearts filled with luscious passion fruit cardamom caramel, dark chocolate hearts filled with decadent raspberry chocolate ganache, and milk chocolate hearts filled with woozy sea salted caramel. And right in the middle but standing out from the crowd—just like your love—is one single ruby red heart filled with Hudson Baby Bourbon. As toe-curlingly delicious to eat as they are gorgeous to look at.